Why is it so important to look after both the physical and mental health of your employees? Physical and mental health are closely connected. People with a long-term physical condition are two to three times more likely to develop a mental health problem. And the relationship goes both ways, because poor mental health can make people more prone to physical problems.2 Here we’ll look more closely at why it’s important for you to take both of these aspects of health into account as an employer. Imagine a situation in which two of your employees needed support: one for a physical illness, and the other for a mental health condition. Would you feel equally ready to meet both of their needs? Say one had back pain. They may well feel comfortable about telling you. But even before they had mentioned anything, you would probably notice them struggling to sit down at their desk. So you might quickly become aware of the issue, have an open conversation about their needs, and make practical changes to help them continue working. Most managers would probably be confident about dealing with this scenario. But say the other employee was experiencing depression. They may hesitate to tell you, perhaps due to stigma around mental health. And even if you did become aware that they were depressed, would you then feel confident about taking appropriate action? Research by Bupa has suggested that about a third of line managers would struggle to spot or know what to do if a member of their team had a mental health issue.3 But the approach to identifying and managing mental health issues and physical ones – like the two examples above – isn’t always as different as you might think. Very broadly, as a manager you can help in both cases by facilitating open conversations, listening to your employee’s needs and offering to make practical adjustments. It can be easy to think of mental and physical health as two separate areas, with physical health being the more ‘real’ of the two. But that’s simply not the case. It’s a straightforward fact that all of us have mental health. We have days when our mental health is good and days when it’s bad – just as we do with our physical health. Mental health and physical health are also closely interconnected. Changes to our bodies can affect our minds, and vice versa. For example, a person with back pain may develop a low mood as a result of their condition. Another example is that a person who is depressed may feel physically exhausted or restless because of the depression. Employers are increasingly acknowledging that mental health and physical health both need to be taken into consideration, and treated as an equal part of their employees’ overall wellbeing. Did you also know that, compared to workers absent because of a physical illness, those absent due to mental ill health are seven times more likely to need further time off?5 Aside from the business costs this brings, it may also mean that workloads may grow for other colleagues, potentially causing further stress within the team. It’s clear that there are good reasons to meet both the physical and mental health needs of your team. Although this is changing, most employers have traditionally focused more on physical health. So what steps can you take to improve your support around mental health? Learn more about mental health conditions, including some of the early warning signs that a member of your team might be struggling. Consider arranging training for yourself and other employees to promote mental health awareness. Find out how things are at the moment. Have open conversations and consider running a mental health audit. Be flexible with employees who are experiencing mental health problems. Consider options like working from home and changes to their hours that might help them to recover or stay in work. Remind yourself or the support that your organisation offers around mental health. This will allow you to feel confident in relaying this to colleagues. For example, does your organisation have an employee assistance programme (EAP)? If so, does everyone in your team know about it? Be clear about your organisation’s mental health policies and procedures. 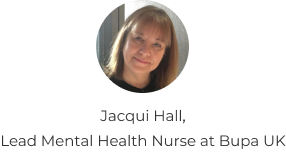 Ensure that mental health is considered in other relevant policies, for example sickness absence and health and safety. Visit the Bupa workplace mental health hub for more practical tips to help get you started, and to build confidence in supporting good mental health within your workforce. Want to find out more information on our business products and services? We have a wide range of health products and services for businesses that want to cover between 2-250 employees. We also have a wide range of healthcare solutions designed for businesses that are looking to cover more than 250 of their employees. Bupa Connect gives you the freedom to manage your business clients. You can create quotes, renew and update your clients’ details instantly. It’s quick, easy and helps you do business your way.